University of Nottingham > Blogs > Off Campus > Campaigns > Could Sustrans help you to get on your bike? Could Sustrans help you to get on your bike? 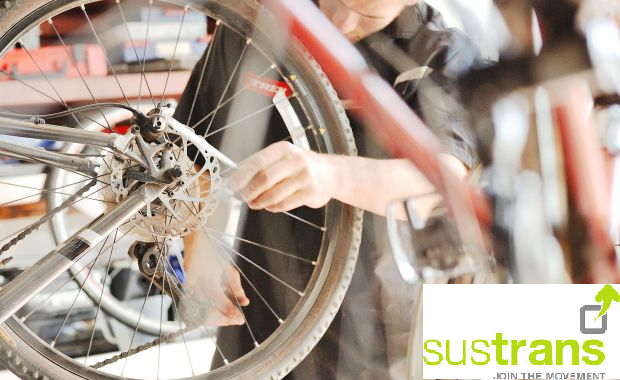 Sustrans is a charity which encourages people to travel more by foot, bike or public transport. They work with communities and policy makers to promote healthier, cleaner and cheaper forms of transport. Their work has created better walking and cycling links, including the national cycle network, across the UK. Sustrans aim is to have 4 out of 5 journeys to be made by bike, foot or public transport by 2020, which is double the current figure. They feel that journeys fewer than 5 miles should be made by foot, bike, or public transport. If this were to be achieved then the country as a whole would see much less congestion on the roads, our carbon footprints would be significantly lower and many would be leading a much healthier lifestyle. Sustrans work with universities and colleges on a range of initiatives to increase walking and cycling amongst staff and students. They collaborate with partner organisations to offer a range of services and activities to provide students and staff with the information and resources needed to make more of their everyday journeys on foot or by bike. This is very important to students as it opens up previously unknown travel options, which could both improve student’s lifestyles, but also save money on travel. Sustrans is keen to increase cycling numbers and to ensure that cycling is easy and safe for students. The ‘Ready, Set, Pedal!’ campaign launched in Portland outside the Atrium on 18th November, it was a great way for students to find out a range of useful cycle related information, along with a chance to win a free digital camera. Sustrans were informing students about the support they give regarding alternative transport options available to students, including their bike hire scheme, maintenance workshops, ridewise (which is aimed at improving the skills of beginners) and Dr. Bike, who was also at the launch event fixing students’ bikes for free. Students also found out more about Ucycle, which is a Sustrans project aimed directly at Students and staff at the Nottingham universities, to increase cycling numbers. Would you like to find out more about Sustrans? Visit the website at http://www.sustrans.org.uk/ which will provide all their information and how they can help students. If you would like to speak with Joanna Ward who is Sustrans Project Manager, Ucycle Nottingham, then you can email her at Joanna.ward@sustrans.org.uk. Ready, Set, Pedal! – What’s It All About?